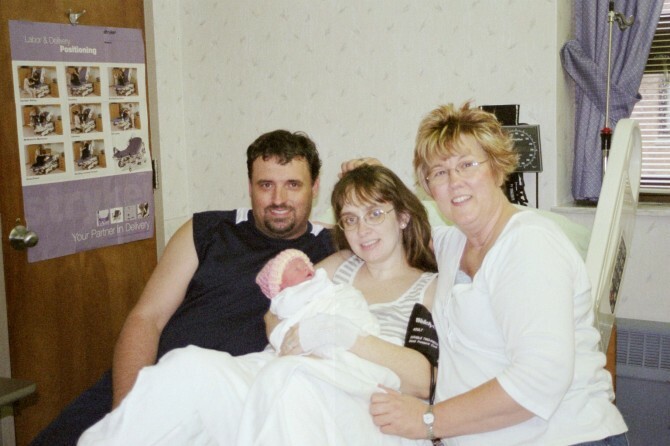 With the birth of my first child 13 years ago, I was 19 years old. I didn’t have any experience with childbirth except for being in the delivery room with a friend when she had her baby. So to say I wasn’t very knowledgeable on the subject is an understatement. I had a pretty normal pregnancy and chose a midwife. I had 3 estimated due dates and went past all 3 of them. I ended up having to plan an induction because I didn’t go into labor. Because of things going on in my life, I was living in a safe home in another county so I felt alone even though I had my parents and the people I was living with. I went in for the induction as scheduled and after 28 hours, ended up with a c-section. I was scared through my whole labor and felt like a failure because I wasn’t able to have a “normal” birth. After all, at my first doctors appointment I had been told I had “great birthing hips” so childbirth should have been a breeze. I didn’t get to bond with my son after he was born because of being in recovery and it hurt to even hold him. I didn’t have anyone to really help me through it because everyone I had anything to do with at the time didn’t know much about c-sections because they had had vaginal births. When I was in the hospital, my Godmother Sarah came in to be one of my nurses. Sadly I hadn’t known she even worked in the Family Birthing Center. She said that I should have asked her to be with me because she would have helped me with my fears and maybe there would have been a different outcome. Fast forward a couple of years. Now I was remarried and dealing with male fertility issues. My husband had to have a testicle removed due to cancer and then had a vasectomy reversal done and now we were being faced with a very low sperm count. We were told our chances of having children were between 1.7% and 2.5%: not good news. We were given options of adopting, invetro-fertilization, or sperm donor. After talking it over, we decided to talk to Sarah. After a lot of time and consideration, we chose sperm donor. Sarah went above and beyond with helping us on this long journey. She was there through contacting clinics, making choices, numerous doctor appointments, clomid, ovulation tests, and so on. During one of the inseminations, there was a mobile hanging above the table with suns, moons, and stars on it and she said that if it worked, that should be the baby’s theme. I found out I was was pregnant but ended up in an accident and miscarried 3 days later. So we waited 3 months to start the process again and the first time we tried again, it worked! We asked Sarah to be in the delivery room with us because she had been so involved in helping us to get to that point. When we asked her she cried and said she would love to be there. I was terrified that I was going to need another c-section and she knew that my goal was a VBAC. Because I had not gone into labor before, I didn’t know what to expect so any time I had a question, I called Sarah. My due date was approaching and I kept getting more nervous because of my last experience. Then one day baby kicked and I thought I peed myself, but it kept coming so after calling Sarah, I went home and got ready to go to the hospital. Sarah met us there and walked the halls with me, helped me go to the bathroom, helped me understand what was going on, talked me through contractions, calmed me down when I needed it, you name it, she did it. After 12 hours of labor and one dose of pain meds, I had my son VBAC. I was thrilled! And Sarah had helped me do it. Fast forward about a year. I got the flu and it just kept hanging on. I made the decision that if it didn’t clear up, I was going to have to go to the doctor to find out what was going on. I decided to take a home pregnancy test since they always ask you if you could be pregnant. I knew it would be negative since we had been given less than a 1% chance of ever getting pregnant without any help, but at least I could tell them I had taken one. Imagine my shock when I saw two pink lines! After the initial shock wore off, another call was made to Sarah. We definitely wanted her to be in the delivery room again after having such a successful experience last time. Again she was there for any questions we had during the pregnancy. When I was 5 months pregnant, I slipped in the mud and fell and Sarah was right there with advice and help with questions and our fears. 3 weeks before my due date, my water broke. I was terrified when I called Sarah to tell her and she reassured me that everything would be ok. Just hearing her voice made me feel better. She met us at the hospital again and was there for walking the halls, bouncing on the birth ball, going to the bathroom, helping the fears, and adding humor. Again, you name it and she did it. She got me further in this labor without the pain meds and when I finally decided I needed them, it was too late, baby was coming. So 12 hours of labor and no pain meds, I had my daughter and my second successful VBAC! My daughter was healthy despite being 3 weeks early and everything was ok, just like Sarah had said. Again we were thrilled with the outcome that couldn’t have happened without Sarah’s help. Fast forward about 3 years. I had lost my husband and was newly engaged. I was surprised to find out just before Christmas that I was expecting again. We decided to call Sarah and ask her to help us out again and she said yes. With each pregnancy I learned a lot of things from asking Sarah questions and doing my own research. I had really enjoyed my completely natural birth the last time and I wanted to do it again. About a month before my due date, I searched for natural birth on youtube and came across one about HypnoBirthing. I got really excited on it but thought it was too late in my pregnancy to learn the method so I watched a lot of videos on it and other natural births to gear myself up for my own upcoming birth. A few days before my due date, I was in the living room with my other kids and pop went my water. I had my oldest get a towel and the phone and I started to make phone calls. We still hadn’t finished packing and my oldest went in to overdrive with helping us. When my parents got to our house, we left and Sarah met us at the hospital again. I had tested Group B positive and I had to have antibiotics so they had to get that started right away. Again Sarah helped me and talked me through everything. She even kept my fiance in line 🙂 Because he was nervous he was trying humor and wasn’t doing very well so Sarah finally started telling him what he could do to help. She really helped him get more involved so he didn’t stand so much on the sidelines. After 5 1/2 hours of labor and no pain meds, our son was born and I had my third successful VBAC. Labor progressed so quickly that my mom never made it to the hospital to be in the delivery room. This was my fastest delivery and Sarah made sure we got through everything and helped us grow as a couple as well. Fast forward about a year and a half. Just before Valentines day, I found out I was pregnant. We immediately called Sarah and found out she was studying to become a doula. She had been doing this for a long time so she had decided to make it official. We told her we were thinking of doing HypnoBirthing and she was totally on board. We did our checking and found local classes and made arrangements to attend at 7 months. Sarah requested a book as well so she could understand HypnoBirthing completely so our birth experience would be exactly what we wanted. She even attended a HypnoBirthing training for doulas. With HypnoBirthing, the language changes and she took the time to change everything she knew as a labor and delivery nurse. The fact that she did this because it was what we were doing still amazes me. One of the things I really wanted this time was to be treated like I had not had a c-section. My old doctor had moved so I had to find another one and that kind of scared me. I didn’t want to start over with someone who wouldn’t help me have the birth I wanted. We asked Sarah who she suggested and she immediately told us her opinion. We met with the doctor and had an instant connection. We were nervous to tell her we were doing HypnoBirthing because we always got funny looks when we told other people and we were worried that she wouldn’t accept it. We were surprised when she told us she had actually attended a HypnoBirth before and she thought it was wonderful. And she said we could pretend as if I had never had my c-section since it had been so many years ago and I had had so many successful VBACs. Since my water had released with my last 3 births, I expected it to be that way again. I kept having practice labor all the time but it never amounted to anything. 5 days before my due date I sent my husband off to work and laid back down. I was having some more practice labor but went back to sleep. Mid-morning, I started to think that maybe it wasn’t practice labor so I called my husband home and called Sarah. She said she had some things to do and to expect her in about an hour but to call her if I needed her sooner. After my husband got home, he got me sitting in the recliner and I listened to my HypnoBirthing cd. My youngest wasn’t in school yet so he was playing while my husband packed the rest of the bag. When Sarah arrived, my husband was trying to help me and take care of our youngest so Sarah said for him to go to me and she took our son with her to the kitchen and tried to get him to eat. Then she came in and had my husband get things ready while she sat with me. She suggested calling the clinic to tell them I was coming in to get checked to see if I was in labor. While on the phone, she pushed some pressure points and my surges got stronger very quickly. She helped me to the bathroom and I said it was time to go. Sarah gave her keys to my mom so she could ride with us and my mom left ahead of us. Sarah tried to help me in the back seat of our van but when I lifted my leg, I felt the baby’s head right there and I started to panic. Eventually we got in and my husband drove while Sarah sat in the backseat and helped me through the 10 minute drive to the hospital. When we got there, Sarah got a wheelchair and wheeled me up to the Family Birthing Center while my husband parked the van. When we got upstairs, all the nurses went into speed mode to get things situated. Sarah knew that the doctor had said we could pretend no c-section had happened so she was my advocate while I tried to get back into my HypnoBirthing. I ended up turning my cd up really loud so I couldn’t hear the nurses while Sarah saw to it that our birth plan happened. In a matter of 16 minutes of arriving at the hospital, our daughter came into the world into the nurses hands as my mom walked into the delivery room. The doctor arrived a few minutes too late. We were so happy! Sarah had seen to it that our birth happened the way we wanted it to, despite the speed of it. I have had Sarah with me for 4 of my births and I plan on her being with me for any future births. I feel that I have had 4 successful VBACs because of her. Sarah has restored my confidence in my ability to birth. Because of her, I feel empowered. She is truly an asset throughout the pregnancy and birthing process and I would recommend her to anyone who is expecting a baby, whether it’s their first or their fifth. When we found out we were expecting, we decided to talk to Sarah and see if she wanted to be in the delivery room with us and of course she said sure. Any time we had questions or concerns throughout the pregnancy, we always contacted Sarah for the answers first. She was always calm and reassuring no matter what time of the day or night we called her. In the last few weeks before our baby’s birth, my wife had a lot of false labor so we would call Sarah to let her know what was going on. My wife had one instance where she was dehydrated and thought she was in labor. Once she got hydrated again, the contractions stopped. Sarah always told us different things to try and everything she mentioned would either progress labor if it was true labor or it would stay the same or completely stop it if it wasn’t. There were many nights that we were outside walking around in our driveway to see if the contractions would change. I’m not sure how many laps we made around but I believe I lost about 10 pounds in the first couple of days 🙂 A few days before the due date, before I went to work I asked my wife if it was ok to go to work. She said I could and she would call if anything changed. After I had been at work for a couple of hours, I was paged for a phone call and I knew right away that it was time…..FINALLY!!! Sure enough, it was my wife telling me that her water had broke. I immediately headed home because I didn’t want our baby to end up being delivered at home. When I got home my wife was standing in the living room with a towel between her legs and our oldest son running around in PANIC mode trying to help us finish getting our things by the door. In the meantime, my wife had called Sarah to let her know what was going on. After my wife’s mom got to our house to stay with our other kids, we went to the clinic to verify that her water had broken. As soon as the doctor told my wife to lie down, more fluid gushed out and he said that it definitely had broke and that we needed to go to birthing center right away because she had tested Group B positive so she needed antibiotics started. When we got there, I was completely out of my element because I didn’t know what to do. I kept trying to make jokes to lighten the situation but it clearly wasn’t the time for that and it became obvious very quickly. I’m not sure if it was pity or if she just couldn’t take anymore but Sarah took me aside to give me some hints on how I could be more helpful instead of such a pain. After that we got along just fine 🙂 I realized that she wasn’t going to take my humor at that time and I was quite ok with that. There was a point when my wife felt that she couldn’t do it anymore and Sarah reassured her by saying “Yes you can and you are.” I felt helpless at that time but it was a good feeling to know that my wife was in the best hands there was with Sarah. Not long after that, our son was born. I was quite emotional after his birth because at that time it became real. Sarah took pictures, showed me how to hold him, and helped me give him his first bath. Sarah took his footprints and wrapped him in a warm blanket. She helped me start the bonding process and how to support my wife in her breastfeeding. She even helped us with the carseat when we were ready to leave the hospital. The help and support didn’t end after his birth either. When we had questions on anything, she was always there, offering us help. About a year and a half later, we found out we were expecting our fifth child. We immediately decided to contact Sarah and ask her to join us in the delivery room again. She gladly accepted and was very excited to tell us that she was training to become a doula and that we were going to be one of the couples that she used towards her training. We told her that when we were expecting the last time we had found something called HypnoBirthing and that we really wanted to try that this time but we still had to research it. Sarah seemed very interested and asked to be kept informed so she knew how she could help us. Just like the last birth, she was always very knowledgeable and calm no matter what the situation. Our pregnancy was mostly uneventful and anything that we needed to know we went to Sarah. In the summer, my wife enrolled us in a HypnoBirthing course. It sounded interesting so I thought what the heck. At first it all seemed weird but as the classes continued I thought it was really cool. The techniques that were demonstrated in class were really fun and helpful. We talked to Sarah about the things we were learning and she even got a book herself so she could read it. She even checked out their website and found a class they were offering that she wanted to take but didn’t know if she could because it was around our birthing time. She was very eager to make sure she knew about what we wanted to do with our birth. A few days before our estimated birthing time, I went to work like usual. It was late morning when I was paged for a phone call. It was my wife and she told me that maybe I should come home because she felt “different”. I decided it was best if I did go home just in case she was in labor. When I got home, my wife was getting a few things together and I told her she should get comfortable and listen to her relaxation CD’s. I helped her get settled in the recliner with her headphones. While my wife was listening to her CD’s and getting into her relaxation, I was busy getting the rest of our things together and packed in her bag. When Sarah arrived, she asked how things were going. She watched my wife go through a couple of surges and decided that she would try to feed our youngest so I could help my wife. After a little while, Sarah and I switched places. Sarah pushed on pressure points to help progress the surges further. We phoned the doctor’s office and it was decided we would go straight to the birthing center. The ride there was interesting because my wife had tried to get into the van and when she lifted her leg, she felt the baby’s head like right there so she started to get out of her relaxation and tense up. She felt sick on the way there and since she couldn’t get relaxed again with her CD’s, she did a lot of wiggling. We were kind of worried that the baby would come in the back of the van! When we got to the birthing center, I pulled up in front so Sarah could get my wife in the wheelchair and get her to the birthing center. While she did that, I went and parked the van. It seemed to take forever to find a spot to park but at last I found one, although it was a lot further away than I had envisioned. I made a mad dash for the hospital and hurried to get to the birthing center, I didn’t want to miss anything! When I got there, Sarah was helping my wife with her relaxation and the nurses were trying to ask her a bunch of questions. I jumped in and started to answer them so my wife could relax. My wife asked where her mom was and she walked in just as our baby’s head slipped out and the rest followed. From the time that we pulled up to the hospital to the time of birth was 16 minutes!!! The doctor didn’t even get there. The nurse was checking her and ended up catching our daughter. She wasn’t even able to get the second glove on! Sarah helped make this birth remarkable by wanting to be involved in our HypnoBirthing. It was wonderful! As it turned out, our daughter came before the class that Sarah wanted to take so she was able to go. Not only has Sarah made difference in our lives, I feel that we made a difference in Sarah’s because of the HypnoBirthing. Sarah is a very valuable asset to pregnancy and birth. I have learned a lot of things from her and I never felt stupid with anything. I would recommend her to anyone who is having a baby!